Why People Choose Mail Order Pharmacy? I was looking for something else in the Express Scripts Drug Trend Report 2005 when I came across this study referenced on page 209. I should have remembered since I wrote this section (yes I was a contributor see page 332). 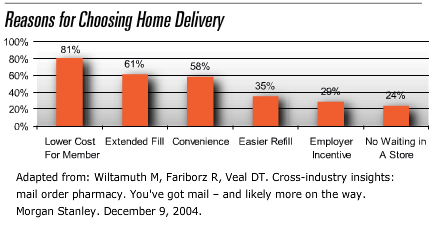 This is a Morgan Stanley study which talks about why people choose mail order pharmacy. Of course, the primary reason here is savings. The more savings the higher the likelihood of a person moving to mail order. This is a factor of savings per Rx multiplied by the number of maintenance drugs that an individual has that can be filled at mail order (or home delivery). This study shows the frequency of the response. If you focus on the weighted scores, you would see a dramatic cliff after savings. (I.e., 61% of people may choose mail for convenience, but they are much less likely to do it than someone with significant savings) So, why don’t all PBMs communicate exact patient savings to each individual? It’s hard. Given minimums and maximums; deductibles; percentage copays; and other benefit plan designs, the systems are stressed to produce this.